Police officers on patrol. Photo courtesy RSCNPF. Basseterre, St. Kitts, May 12, 2017 (SKNIS): Traffic authorities are expected to be more vigilant in enforcing national laws regarding the tinting of vehicles in St. Kitts and Nevis. The legally accepted percentage of tint on vehicles is 35 percent. However, various vehicles can be seen on the road with a darker tint. Only security or emergency vehicles or those otherwise authorized by the relevant authority are allowed to have a higher tint percentage. 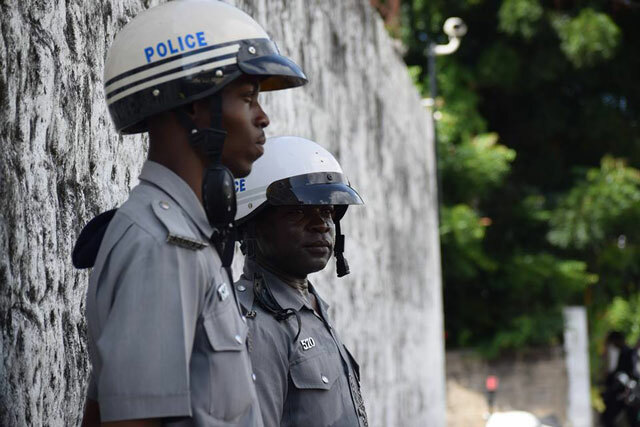 Commissioner of the Royal St. Christopher and Nevis Police Force (RSCNPF), Ian Queeley, said this will be addressed, as officers have observed an increasing trend where darkly tinted vehicles are used when committing crimes. Some of the vehicles used were rentals and the law currently prohibits any tinting of public service vehicles. The deadline was January 2017. Commissioner Queeley said that owners of illegally tinted vehicles will be taken to court. If convicted, the maximum penalty is a fine of EC$5,000.